So I admit, I might be a little obsessed with cauliflowers these days. But I love the versatility of this vegetable and how it can be used to make healthy low-carb dishes. Over the past few weeks our dinner has included cauliflower rice, cauliflower pizza and now recently cauliflower cutlets. You can add chicken or fish to these cutlets according to your preference. Boil the potatoes separately and let them cool. Add a pinch of salt to the water you use to boil the potatoes. Break the cauliflower head into pieces. Add the boiled potatoes, cooked chicken (or fish), cauliflower pieces, ginger-garlic paste, cheese, salt, chillies and coriander powder to a food processor and grind everything together. Now place the mix in the fridge for at least an hour. Take out of the fridge and add one egg and one tablespoon cornflour. Mix well with a fork. Now shape the cutlets with your hand and fry on the pan. Serve these cutlets with rice or a fillet of fish. 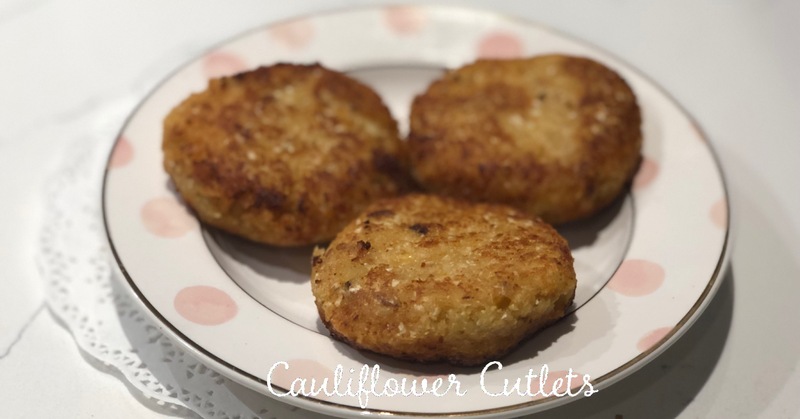 The cauliflower cutlets are healthy and a great way to get more vegetables in your diet. I add left over fish or chicken in the cutlets also to give more taste. I’m going to make these next time we have cauliflower, they look so tasty!!! I have gobi. I have aalu. and I have cooked shredded chicken. If I can get over this viral then I am so making these tomorrow!